I want to take this time to express my gratitude and appreciation to all the parents, teachers and staff who has volunteered their time to help out at our events over the past few months. From getting pied in the face at our Harvest Festival, working the ticket booth, to cutting box tops at home or organizing and distributing our Otis Spunkmeyer orders, it was so amazing to see our school community come together! As a result, we have had some amazing fundraisers and community events. And, it’s only November! I am so proud to announce that our Otis Spunkmeyer fundraiser this year was a HUGE success! We brought in a total of $30,301.00 in sales and 40% of those sales will go back Vinci Park PTA. That’s $12,560.40 that will help fund classroom supplies and field trips! Major kudos goes out to the PTA board for executing this fundraiser. A lot of work goes into planning and executing a school fundraiser such as this and it could not have gone any smoother so thank you to all those involved! Our Harvest Festival this year was also a huge success. It was so well organized, and with the amount of volunteers we had, everyone was able to enjoy the festivities. The kids were dazzled by our magician Spencer Grey and they had a blast throwing a pie at their teachers! Our next free community event is our Holiday Pajama Party on December 7th from 5:30-7:30pm. Check out the poster outside your child’s classroom and watch out for a flyer that will be coming home with your child in the next couple of weeks. Make sure to come in your favorite, comfiest pajamas and be ready to meet and greet Santa Claus! As we approach the holiday season, I want to wish everyone a wonderful and blessed Thanksgiving holiday with their loved ones. May your Thanksgiving be filled with love and cheer! Hope you are enjoying the beautiful brilliance of the fall season. As we approach the month of November, I would like to mention a few upcoming events. Parent-Teacher Conferences will begin November 26. You will have an opportunity to discuss your child’s progress and the contents of the report with his or her teacher/s. Please use these conferences to your advantage. Be sure to come with questions, concerns or compliments. Use the time to discuss things you are unsure about or hope for your child. Pay attention to the comments your child’s teacher has, and help us make this a successful year for everyone. California Department of Education (www.cde.ca.gov). I am asking that parents/guardians please use the horseshoe ONLY for drop and go purposes when bringing your student to school in the morning. If you feel the need to assist your child out of the car or walk them in, YOU MUST park on the street. I ask that you are respectful to parents who are on their way to work and on a time schedule. It creates a dangerous situation when cars try to go around those who have gotten out of their vehicles. If you are bringing your child in late to school, you MUST bring them into the office and get a late pass. Please DO NOT drop them off and watch them enter the classroom from your car. Let’s all work to keep our most precious gift, our students, safe! Finally, I would like to continue to invite parents to attend our School Site Council and PTA meetings. During our November meeting we’ll be revising/aligning our school’s mission and vision statements. We are in need of volunteers to work on our yearbook. This is an ongoing project that can be done online at home. If you are interested, please contact ptaboard@vinciparkpta.com. Thank you to everyone who participated in our Fall fundraiser with Otis Spunkmeyer and Popcornopolis popcorn. We brought in a total of $30,301.00 in sales and 40% of those sales will go back Vinci Park PTA. That’s $12,560.40 that will help fund classroom supplies and field trips! Congratulations to both Ms. Angarano’s Kindergarten class for being the overall top class to sell 176 items combined and to our overall top seller, second grader, Darius Calanche who sold 79 items. During our Fall Harvest Festival last month we had a student pumpkin design contest with 20 contestants participating. The pumpkins were either carved, painted or decorated. There were many Halloween themed pumpkins with carvings of a witch, a bat, a cat, and jack-o-lantern faces. While others were decorated and painted designs of a spider, a mummy and of funny faces. Congratulations to all of the participants. Everyone did a wonderful job with their creations and it was an entertaining sight to see. 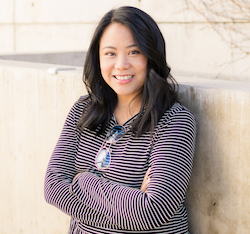 Our first place pumpkin was designed by 3rd grader Ace Tran. 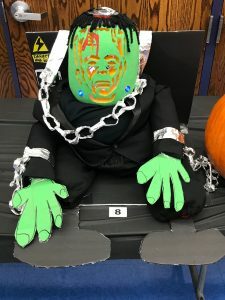 His pumpkin had a Frankenstein theme and was both carved, painted and decorated. 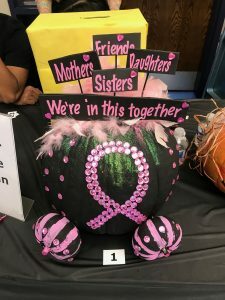 Our second place pumpkin had a pink ribbon theme symbolizing breast cancer awareness. It was painted and decorated by 1st grader Renae Gomez. We are pleased to announce the results and winners of the Box Tops for Education contest! Classroom winner for TK-3rd: Mr. Torrez’s 3rd grade class with 311 Box Tops submitted. Classroom winner for 4th-5th: Mrs. Stone’s 4th grade class with 220 Box Tops submitted. Overall our students collected and submitted 3147 Box Tops last month, earning $314.70 for our school. Many thanks to everyone who participated! Keep collecting those Box Tops. The next submission will be later in the school year. Every first Friday of the month each class competes to see who has the most spirit, aka “Vinci Blue Fridays”. Congratulations to Mr. Torrez’s 3rd grade class and Ms. Perla’s 4th grade class for winning November’s Vinci Blue Friday. Our next Vinci Blue Friday will be December 7th. The winning classes will earn a small prize. Explorers, show your school spirit by wearing blue or a Vinci Park t-shirt or hoodie. Last week, a permission form for a “Walking Field Trip” for November 26th-November 30th, 2018 was handed out. 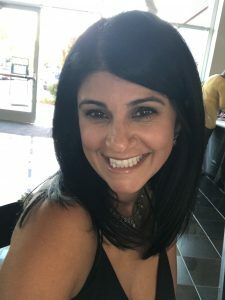 In the event of an emergency during recess or when it is necessary to evacuate further than the boundaries of the campus, designated “Emergency Evacuation Sites” have been planned for the children to go to with their class. The permission form allows for the school to practice walking to these designated sites. Due to the safety of the children, these designated sites are kept confidential, but are nearby. The Berryessa Union School District is required to share its Parent Involvement Policy. You can view the policy here. PTA meetings are held each month in the staff lounge at Vinci Park. We discuss upcoming events, provide a financial report and our Principal Parisa Nunez shares updates concerning our school and students. Coffee and pastries are provided. 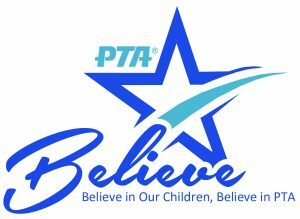 Our next PTA Meeting will be held on January 10th at 7:15 am in the staff lounge. Please note that there is no meeting in December. Join us for an evening of holiday arts & crafts, letters to Santa, cookie decorating, and pictures with santa. We will have pizza, chips, hot chocolate bar and other beverages for sale. Volunteers are needed from 3:30pm-5:30pm to help set up, 5:30-7:30pm for overall event assistance and 7:30-8:30pm for clean up. If you are interested, please contact ptaboard@vinciparkpta.com.